Looking for the petition to save Hoi Ha? CLICK HERE. Hoi Ha, Hong Kong’s idyllic seaside village on the Sai Kung peninsula well known for its rich marine biodiversity, has been the centre of controversy in recent weeks. The village overlooks Hoi Ha Marine Park, one of HK’s four marine parks that is also a site of Special Scientific Interest ( SSSI) and a natural gem in Hong Kong’s urban jungle. 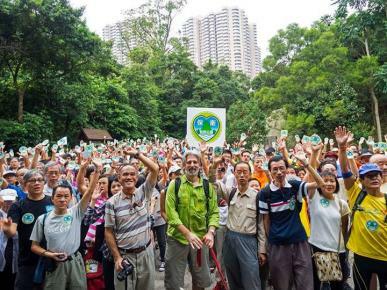 Save Our Country Parks, an alliance of 20 green groups including Friends of the Earth and WWF Hong Kong, recently organized a hike around Tai Tam reservoir to raise awareness of and show appreciation for Hong Kong's Country Parks. Sea Shepherd has also become involved to support, launching “Operation Hoi Ha” this week in an aim to highlight the importance of protective the ecologically rich area. A small team was sent to Hoi Ha for three days, to document the underwater life on the reefs as well as to get a clearer understanding of where the threats to the coral would likely be coming from, and their proximity to the reefs. Plans for development of flats, jetties and more have been floating around, but no one has been consulted. Small house construction in enclaves have been threatening the country park for years. This encroachment may lead to plans that allow for large-scale small house developments. Hoi Ha village and its surrounding area has been designated a Development Permission Area (DPA) by the Town Planning Board (TPB) to allow any one who had comments to provide their input. But this DPA has a lifespan of three years, after which the TPB must produce a draft Outline Zoning Plan (OZP) that actually becomes the OZP when two months is up. This draft was published on September 27, which means a solid plan will be in place November 27…. but the draft is a disaster for the future of Hoi Ha, as the land has been zoned in ways that will permit developers to dramatically change the area. Dr. Andy Cornish, a marine ecologist who has conducted research in Hoi Ha for over 15 years said, "The village of Hoi Ha is already extremely close to the shore of the marine park, and run-off from the land around the village flows into the same bay where 64 out of 84 hard coral species can be found. Allowing so many additional village houses - equipped only with septic tanks which routinely fail and release pollutants, never mind the inevitable waste run-off during construction, poses a serious risk to the coral communities, and should not be contemplated." How anyone could want to destroy this beautiful natural bay for personal profit is beyond comprehension, if this proposal is approved it will be a trans-generational environmental crime! At the moment this pristine bay is used by children from many schools who run outdoor activity classes, connecting the next generation of Hongkongers with nature. This is something that Hong Kong needs far more than just 100 homes which will not solve the current housing problem. Hoi Ha is only the tip of the iceberg when it comes to the battle against development and encroachment of country parks. If this last barrier fails to protect Hoi Ha, other areas such as Sai Wan and Pak Sha O will be vulnerable to the encroachment of developers. More activities to raise public awareness about the importance of balance between development and environmental conservation will be planned for the next few months. 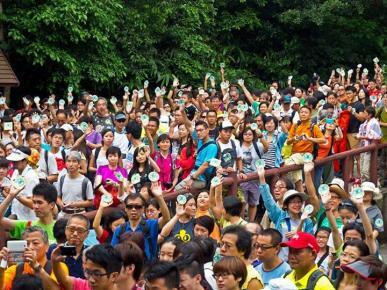 To get up close to the action, join the Walk to Save Hoi Ha taking place this Monday, October 14! Let your voice be heard by signing the online petition to Mr Paul Chan, Secretary for Development and Mr Thomas Chow, Permanent Secretary for Development, Chairman of the Town Planning Board to save our country parks. Sign the petition here.